The Mayor Gallery, London (2408, 4707). Purchased by David Niven in the 1960s. W. Spies, S. & G. Metken, Max Ernst, Werke 1929-1938, Cologne 1979, no. 1884 (illustrated p. 163). 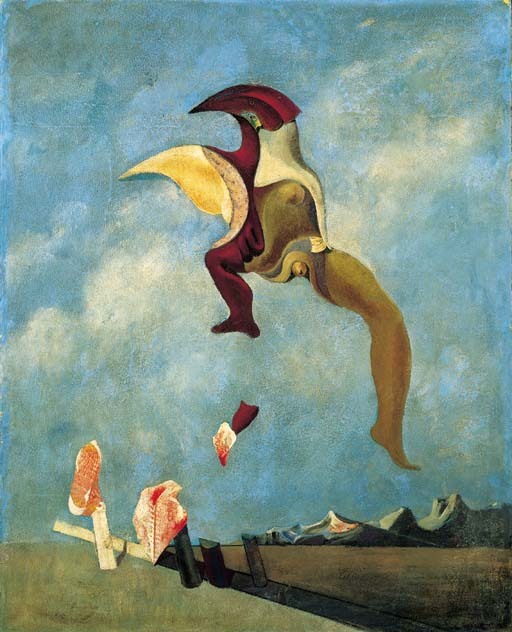 London, Tate Gallery, Arts Council of Great Britain, Max Ernst, September-October 1961, no. 113 (illustrated). Munich, Haus der Kunst, Max Ernst Retrospektive, February-April 1979, no. 209 (illustrated). This exhibition later travelled to Berlin, Nationalgalerie, May-July 1979. "By 1930, after having furiously and methodically composed my novel La femme 100 têtes I was visited almost daily by Loplop, Bird Superior, a private phantom very much attached and devoted to me." (Max Ernst quoted in, Cahiers d'Art, Max Ernst Edition, Paris 1937, p. 24). "A friend by the name of Horneborn, an intelligent piebald, faithful bird dies during the night; the same night a baby, number six, enters life. Confusion in the brain of this otherwise quite healthy boy (the young Ernst) - a kind of interpretation mania, as if the newborn innocent, sister Loni, had in her lust for life, taken possession of the vital fluids of his favourite bird. The crisis is soon overcome. Yet in the boy's mind there remains a voluntary if irrational confounding of the images of human beings with birds and other creatures, and this is reflected in the emblems of his art." (Max Ernst, 'Biographische Notizen' cited in exh. cat., Zurich, Max Ernst 1962-63, p. 23). This painting from 1932 depicts an exuberant Loplop leaping against an open sky above a distant desert horizon. Ernst equated sight and seeing with birds; the eye like an egg gives rise to the bird which, in turn, in the artist's own private mythology and through Loplop the "Bird Superior", gives rise to the artist, the superior see-er or, perhaps, seer. Here, in the present work, Loplop is depicted as an androgynous figure whose form has emerged collage-like from an almost accidental conjunction of painted shapes. A hermaphroditic Birdman with his sharp eyes this Loplop is essentially a Surrealist self-portrait.